In his Plaint of Nature (De planctu Naturae), Alan of Lille bases much of his argument against sin in general and homosexuality in particular on the claim that both amount to bad grammar. The book explores the philosophical uses of grammar that were so formative of Alan’s thinking in major writers of the preceding generations, including Garland the Computist, St. Anselm, and Peter Abelard. Many of the linguistic theories on which these thinkers rely come from Priscian, an influential sixth-century grammarian, who relied more on the ancient tradition of Stoic linguistic theory than the Aristotelian one in elaborating his grammatical theory. Against this backdrop, the book provides a reading of Prudentius’ Psychomachia and presents an analysis of allegory in light of Stoic linguistic theory that contrasts other modern theories of allegorical signification and readings of Prudentius. 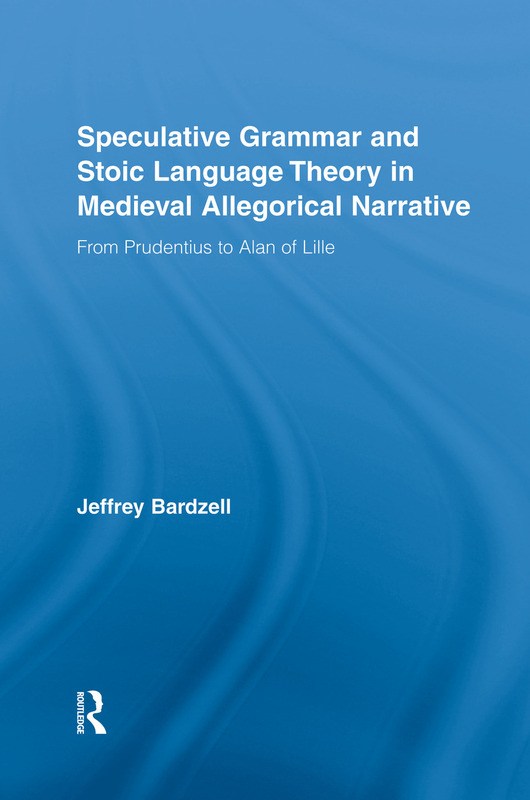 The book establishes that Stoic linguistic theory is compatible with and likely partially formative of both the allegorical medium itself and the ideas expressed within it, in particular as they appeared in the allegories of Prudentius, Boethius, and Alan.